Working a stone’s throw from London’s most bountiful Zara store on Oxford Street, I became accustomed like many others to popping in to review the offering on a weekly basis. I would smile smugly as I managed to nab the cute boucle skirt that is a tantalising replica of the one that has just sauntered down the runway at Paris Fashion Week on the leggy Kaia Gerber a few weeks prior. Scarcity is a sales strategy that is normally deployed amongst high fashion and luxury retailers, but here, parent company Inditex has integrated such a ‘get it or regret it mantra’ into its operations, prompting customers to purchase out of the fear their favourite garment may no longer be present upon their next visit merely a week later. Zara boasted sales of €16,620 million in 2017 generated by over 2,210 stores globally and has been the world’s largest clothing retailer since 2008 when it overtook Gap. Clearly this formula was working for its shareholders and customers alike. I was a cult follower, so much so I had even developed a strong intuition of when the sale was about to begin or the launch of the new season, the way the rails upon rails of clothing were being re-fashioned and re-jigged around the space of the store with sales assistants operating at a pace comparable only to Bocconi students rushing to their 8.45am lectures. What I hadn’t realised and unbeknown to many, was the vast strategic and quite frankly beastly logistical and operational structural process that takes place behind the scenes of our favourite high street hot spot. Did you know that the average Zara dress will have passed though on average 6 pairs of hands across 3 continents before it reaches your closest store? A ‘Made in Morocco’ label sewn to your latest item is a rather misconstrued and inaccurate depiction of the real origin of where your garment was made. What I had also failed to realise was the true cost and toll the phenomenon of fast fashion was having on the world we inhabit. Green Peace predict that by 2025, the fashion industry will generate sales alone of $2.1 trillion. This fashion engine is powered by approximately 40 million garment workers (1/6th of the world’s inhabitants) situated thousands of miles away from European HQ's, the majority of whom earn less than $3 a day. The rise of ‘fast fashion’ which refers to the phenomenon where the industry is transporting the trends on the catwalk to the high street for low production costs at an undeniably rapid rate to meet the demands of consumers, has increased pressure on companies to deliver and remain afloat. We have witnessed the end of the ‘two season paradigm’ with retailers as such as Zara producing up to 20 collections annually in congruence with their core lines to appease younger generations who are spending less and purchasing ever more frequently. This attitude witnesses our compulsive shopping habits purchase close to 80 billion pieces of clothing a year fascilitating the demand that drives Zara, alongside Swedish retailer H & M, Mango and Topshop to churn out garments faster than ever before with disregard for the environmental effects. With a focus on Zara, their value proposition, has amalgamated around the constant flow and delivery of fashionable merchandise at easily accessible prices where an average piece from Zara is worn a mere 10 times. Ex Inditex Chairman, Jose Casetellano professed the key to Zara’s success was about reducing response time as “in fashion, stock is like food, it goes bad quick”, thus for Zara distance is not measured in km, but in time. It relies on cost and time to market strategies integrated into their global value chain and is crucial for them to have five fingers touching the factory and five touching the customer. A value chain, to put it simply, is the way in which a company gains value or competitive advantage by outsourcing or completing a specific stage of production in an alternative location where a supplier may possess core competencies/expert knowledge or locational benefits such as low labour costs, to increase the value of the final end product. Operational activities require the most sophisticated logistics to ensure delivery times are met by its 1805 suppliers and 6959 factories. To clearly illustrate, the journey of a new Zara dress made from viscose can be traced from the bio cellulose production in India, where the fibres are then spun into material in Egypt for it to be woven into fabric in China. The garment may then be transported to Spain to be dyed into the specified colour and then to Morocco, where it is cut and sewn and returned to the distribution centre in Spain. It is true indeed, that your newly purchased Zara item, may have taken more trips around the world than you have so far in 2018! So how does such a logistical operation work to create the staggering profits for Inditex that it does? Whilst the value chain is complex, at its most simplified form, it revolves around 5 key stages; design, procurement, production, distribution and retailing. All of which are highly crucial to obtain maximum value for both the retailer, in terms of profits, and for the consumer in being able to access on trend collections, as the brand can deliver garments from the initial design process to store in approximately 5 weeks. The Inditex headquarters, nicknamed ‘The Factory’, reside in La Coruña, Spain, a geographic area that is strategic and key to its global operations. A commercial army of approximately 300 combine their efforts to produce a measly (I jest) 40,000 items a year, approximately 11,000 of which are escalated further than the design process. 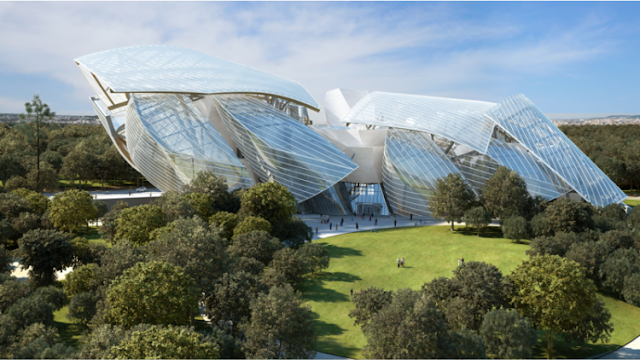 Inspiration and often downright imitations are sourced by trade fairs, catwalks and magazines. The workspace itself is split, designers occupy one side, buyers on the other whilst merchandisers are situated in the middle. 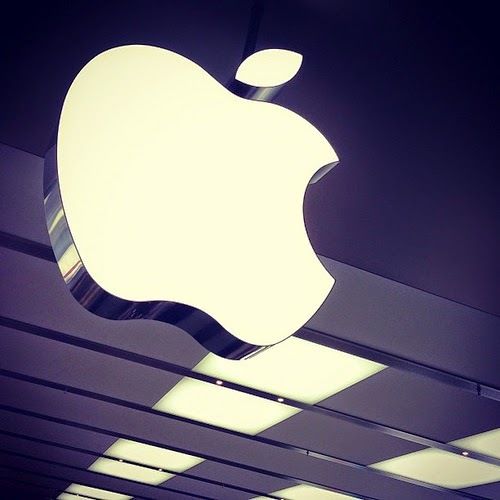 This enables the teams to liaise accordingly as to what is proving to be most popular, as their sophisticated IT infrastructure allows them to trace consumer market data and preferences. Small batches of prototype designs have fabric cut in house and are sewn within The Factory HQ. This set up allows the designers to quickly whip up samples which can then be rolled out on a larger scale once approved. This rapid internal design process creates fashionable items that consumers are willing to pay the full RRP for in light speed timing. Sourcing and the process of acquiring materials requires absolute responsiveness for Zara. Their buyers are situated at offices across Spain and key Asian cities like Hong Kong where the categorising of products, seasons and prices is tailored according to distinct regions. Unlike the majority of retailers with high levels of standardisation, they adopt a one shot design procurement, where an item is replaced with a design extremely similar but not an identical replica. Have you ever wondered why you spot similar versions of the same dress but can never find the original? This is why. A distinguished feature of the Zara model is that it owns over 50% of its suppliers, it has integrated textiles within its value chain to prevent a bottleneck of volumes and supplies of materials and decrease production time. This flexible capacity allows them to postpone production phases to accomodate last minute changes and tailor their offering according to latest market updates on consumer demand. Inditex directly owns companies such as Comditel which in turn has over 200 external suppliers of fabric and raw materials which are able to be cut, dyed and finished in shorter time leads than if outsourced from external sources. 40% of all of their fabric is produced from Comditel and 90% of the subsidiaries production is from Zara. To play it safe and be agile in responsiveness, large quantities of grey fabric which is easily malleable into various designs and colours is sourced from Fibra colour, a dyestuff producer, partially owned by Zara. This facilitates the replenishment of popular items at a rate faster than their competitors and avoids large scale excess orders, ever important for bottom line results. Designs originate from Zara but are often finished throughout their network of medium term suppliers to create the right product with the shortest lead times. Short term higher costs result in long term benefits for the company, as illustrated by the fact in 2001 Zara spent 15% more than its competitors to produce in Spain and Portugal but by doing this it has been able to focus on the medium and high end customer segment in the long term which has generated more value. Once manufactured, garments are sent to 450 workshops in the surrounding areas of La Coruña for sewing and are subsequently returned to warehouses. With over 2210 stores globally, distribution and delivering in quick time are essential and all items pass through the central distribution centre in La Coruña where they are ironed and ready to be shipped. Approximately 45,00 garments are folded per hour and are then distributed according to time zones. Deliveries are received by stores twice a week and are received in Europe within 24-36 hours and 26-48 hours outside of the continent. In 2001 it was estimated around 130 million pieces were shipped from their DC, which approximates to 400,000 pieces in a typical day, 75% of which were sent to Europe. Have you ever wondered why you never see a Zara advertisement on television or in a fold out of Vogue’s latest issue? That is because Zara’s marketing and advertising expenditure stands at 0.3% of their total revenue, compared to its rivals 4-5%. Their sales technique focuses on constantly refreshing collections and the value of scarcity. Luis Blanc former International director stated “we want our customers to understand that if they like something, they must buy it now, because it won't be in the shops the following week”. Zara's ability to produce tiny quantities of popular merchandise has led them to break all previous retail rules and create a 'sense of tantalizing exclusivity' described in Lucy Siegel’s insightful ‘To Die For: Is Fashion Wearing Out The World’. The majority of readers will have sauntered around a Zara store and notice they do not rely on cramming maximum quantities of merchandise into a single space unlike competitors such as H & M. Essential to Zara’s retail strategy is their sophisticated computerized technology which tracks purchasing preferences of individual stores to fulfill demand accordingly and eliminates less popular products to avoid large quantities of garments being sold at a reduced price which can be highlighted by the fact that Zara’s shipments are 98.9% accurate and have a shrinkage of less than 0.5%. Withholding such information allows Zara to react faster to popular trends and in turn decreases volumes of returns and number of garments that must be price discontinued. The company manages to collect 85% of full RRP for an item in contrast to the average for a retailer of 60-70% as consumers are less likely to wait to purchase in Zara as they know it may not be in-store for an extended period of time. A delivery cycle can be completed in a mere 15 days for stock replenishment and from conception to delivery of new items this will take approximately 3-4 weeks. It is no wonder this is causing furore and frustration amongst luxury fashion and designer brands whose designs are beaten by Inditex’s imitations to stores with unrivalled speed. Understanding the mammoth processes that take place behind the scenes, prompts the question, so why does this matter? The simple truth is our current pattern of consumption and production on this scale not only from Zara but the world’s leading retailers, is wholly unsustainable, both socially and environmentally. Socially, you do not have to be an avid follower of fashion to know the industry is synonymous with low cost labour and is often embroiled in scandals. The sub-contracting of labour by suppliers to external sources to meet demand pressures often lack adherence to codes of conduct. Incidents in Bangladesh such as the Rana Plaza travesty in 2013 emphasise this predicament. In this instance, despite hundreds of warnings regarding the garment factory as a “death trap”, the building collapsed killing 1,100 and injuring a further 2,000. Needless to say, the resultant attention helped shed light on global retailers across the world and their supply chain practices and mass production processes. These incidents are now occurring closer to home, in November of last year it was reported that notes had been found in garments originating from Turkey with messaging that included “I made this item you are going to buy, but I didn’t get paid for it”. This highlights that despite owning a large majority of their supply chain, monitoring and visibility of conditions in the upstream part of the chain amongst fourth and fifth tier suppliers is failing. Our demand for fast fashion is directly fuelling and creating pressures that cultivate these practices and exploitation of cheaper labour markets for cost efficiency and quick time delivery. 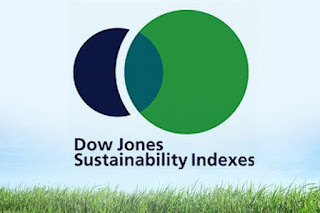 Environmentally, the shock of one global retailer alone on eco systems and natural resources is substantial. Inditex’s corporate narrative speaks of sustainability and commitment to closing the loop on garment production. Zara have recently introduced a ‘Join Life’ collection, parallel to H & M’s Conscious Range, which promotes the care for fibres through the creation of a material called Tencel, derived from wood grown in sustainable forests that guarantee reforestation. 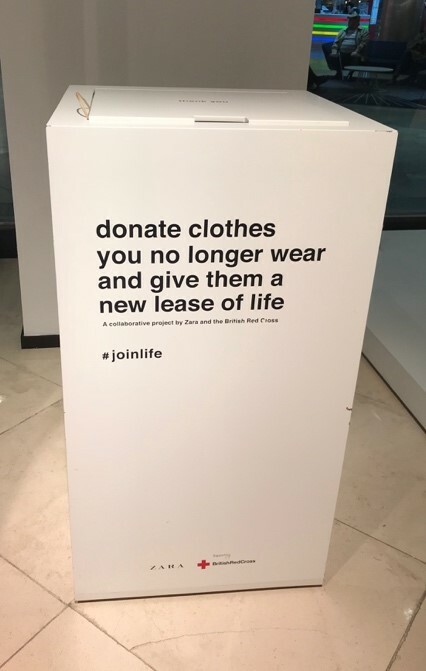 In partnership with the British Red Cross, as part of the ‘Join Life’ campaign you may now also spot donation boxes in stores which promotes the recycling of your redundant old clothes. 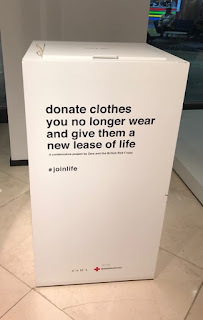 Whilst I would not proclaim this as avid greenwashing as these efforts are promoting a basic level of stewardship, in reality, they do very little to balance or reverse the toll of environmental devastation produced by fast fashion. Impacts of climate change including soaring earth temperatures, rising sea levels and impending wildlife extinctions are directly exacerbated by operations aforementioned. Assessing the emission of greenhouse gases emitted by the Zara fleet of delivery vehicles on an annual basis to over 2200 stores twice a week would be enough to give climate scientists severe heart palpitations. 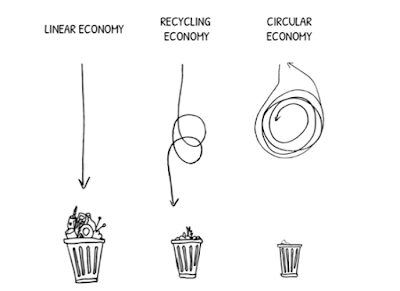 The energy consumption used within product life cycles of a simple piece of clothing such as a plain t-shirt is staggering, not only during the production and distribution phases but also at the consumer end in our laundry and disposal. Did you know that it takes approximately 400 gallons of water to create a simple white t-shirt and approximately 505 gallons to create a pair of jeans? With estimates that by 2030, 47% of the world’s population is predicted to face severe water shortages and that 20% of water pollution is caused by textile processing, we can begin to comprehend the urgency in addressing such issues. On the subject of water, Changing Markets, an NGO dedicated to raising awareness to issues of sustainability, published a report only last Autumn, on the production of Dirty Viscose, naming and shaming the likes of Zara, Asos and H & M. Viscose, alternatively known as bio-cellulose, is a popular synthetic man-made fibre, which is used to create 9.7% of Zara’s garments. 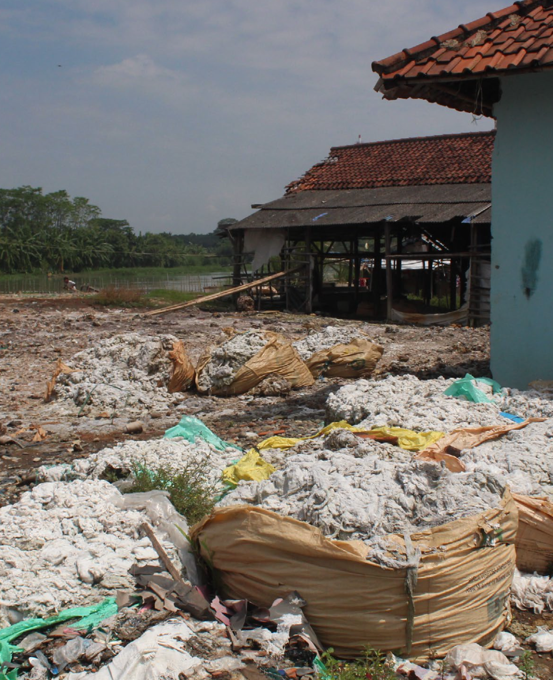 When produced irresponsibly, as has been done by many of their suppliers, the toxins and chemicals used in the process have damaged surrounding ecosystems, water supplies and created a hazardous environment for workers on sites in areas such as Indonesia, China and India. Inditex's formal response to this report emphasised efforts to collaborate with suppliers to improve conditions, sustainable practices and traceability. They claimed to Sourcing Journal in a statement that policing suppliers’ processes was a priority, however, we yet again arrive confounded by the notion of how to truly prevent and prohibit damaging behaviour like this on a global scale in the future. So what does the future hold for the fast fashion phenomenon? 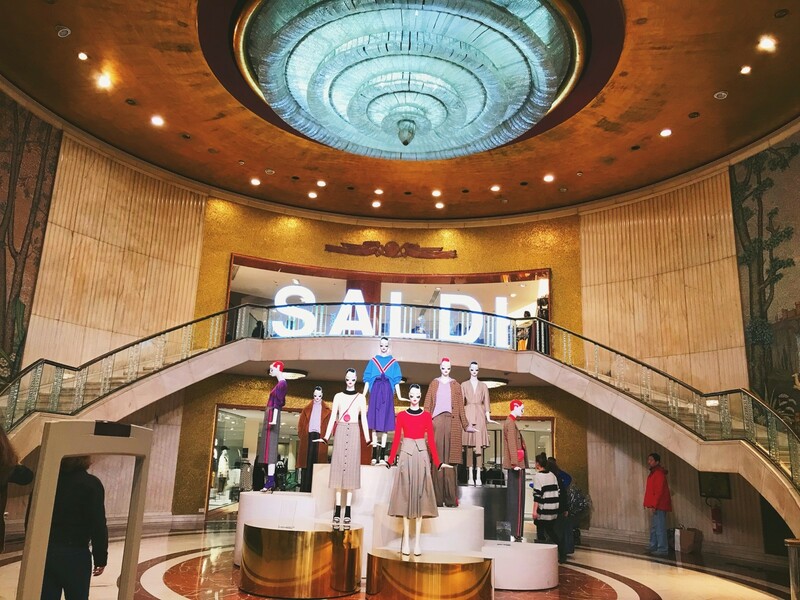 For Inditex, there can be no denying that the business strategy and execution of Zara’s global operations have been a success in terms of bottom line results and net profits of €3.37 billion, a year-on-year growth of 7% in 2017. Consumers of fast fashion reap the benefits with an endless and continuous selection of garments on offer that closely follow the latest trends on the runway for a fraction of the price. However, as conscious ‘prosumers’ and one of the first generations to gain access to the knowledge, hard facts and technology capable of altering processes for the future, we must wholeheartedly acknowledge, this myopic pattern of purchasing is by no means sustainable. Obtaining products at a fraction of the price of their true cost to workers and the natural resources provided by the worlds eco system is jeopardizing future generations enjoyment of our planet. Closing the fashion loop will require dedicated orchestration by many stakeholders and will encounter numerous barriers. For example, at this current moment we lack the infrastructure to effectively recycle many garments made from different blends of fabrics and comprising of additional components such as zippers and buttons. Yet, there is hope. Through collaboration and raising awareness, the future picture can look much brighter. The intent of this article is by no means to preach, as it would be unrealistic to call for a boycott on Zara in the name of sustainable luxury brands such as Stella McCartney as everyone must shop within their means. A seismic positive change can easily be enacted with the alteration of our mentalities and the way in which we shop. There is much to be gained from caring for our items differently through their laundering, and drying phases as well as recycling garments after they have served their purposes in our wardrobes. Extending the life of a garment by an additional nine months can reduce its environmental impact by up to 30%. Mindfully consuming and recycling our fashion has tangible benefits on the earth, as providing one tonne of clothing for direct re-use whether it is through selling online or donating can result in a net greenhouse gas saving of 11 tonnes of carbon dioxide equivalent. Companies are awakening to the huge contributions they can make, for example, it was announced on March 22nd that Gap has pledged to conserve 10 billion gallons of water by 2020. 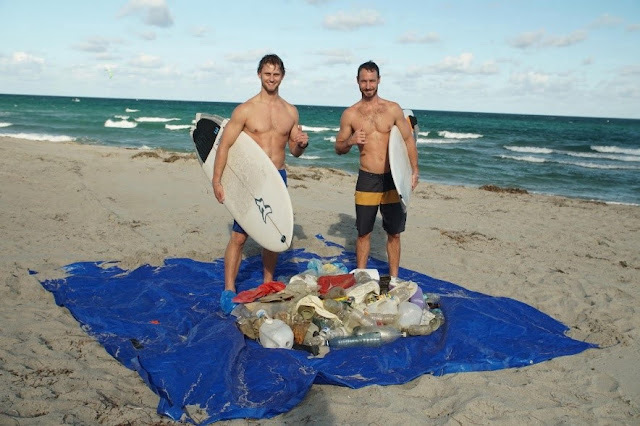 Purchasing mindfully with the ideal that items are to last and cherish can directly curb the acceleration of detrimental impacts the textile and apparel industries are having on the earth. Sustainability within fashion is inextricably linked to innovation and the transition towards a circular economy will be encouraged by us as consumers. So let it resonate, the next time you saunter in to Zara with no idea of what you want, think about what you NEED and consider what our Earth needs!